How to proceed custom order? After purchased the order, please forward us the artwork to Etsy message or our email ops@blackmarketintl.com. 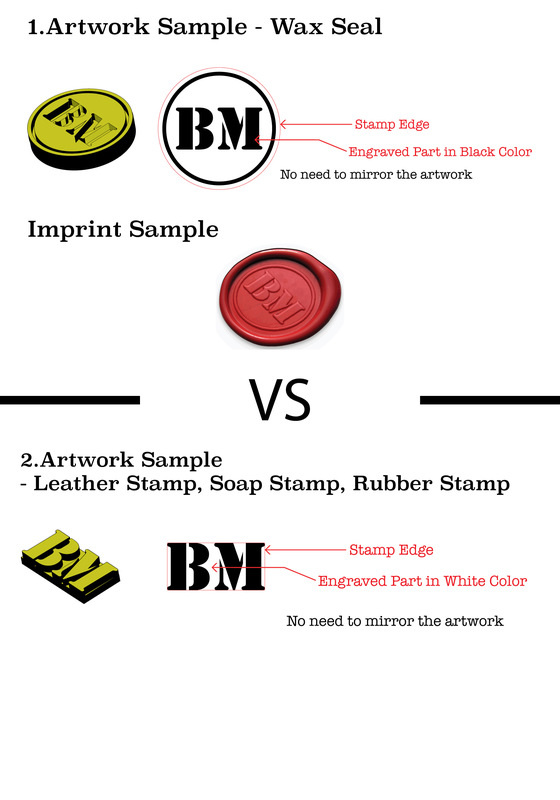 Reference: "Artwork Guideline"
Our team will get back to you shortly with a draft and order details for your comment. If the draft and order details look fine, you can reply to us and approve the draft and order details. We will proceed the production with your approval and dispatch the order as per shipping schedule. If you have questions and queries, please feel free to contact us. What is the right format for artwork? Design in a actual size in the file. Red border for the stamp edge. Wax Seal: The black area indicates the engraved area. Anything black will be raised when pressed in wax. Leather Stamp / Soap Stamp / Rubber Stamp: The white area indicates the engraved area. Anything black will be raised on the stamp. What if I don't know how to work out a requested artwork format? How to make a wax seal? Cut a small piece (about 1 cm) of sealing wax into the spoon and melt it with a white candle. Drip the wax slowly on the design area to avoid bubbles. Stamp on the melting wax. Wait for 20-30 seconds for cooling down. Do you provide custom or personalized service? Yes, we provide custom service for all kind of stamp. For the custom wax seal, please visit following page in our store. "Custom Wax Seal Section"
How many seals for each wax sticks could make? Each sealing wax stick makes around 8 seals. What is the material using for wax? Our wax is flexible wax, unlike the traditional one, the flexible wax is more durable and capable to survive through the postage system. We are very confident and 100% sure the seals will not break. Do you sell sealing wax with wicks? Why or Why not? No, we do not sell any sealing wax with wicks. The wick is made in cotton, it burns incompletely and converts to carbon dirt. It leaves a dark residue on the beautiful seals. Can I change the sealing wax comes in the set to other available colors? Yes, sure! The set default comes with wax color red (#00J), silver (#00H) and gold (#00A). We are happy to mix and match the color for you. Please give us a note during the checkout and our team will arrange it accordingly. It would be highly appreciated if you can mark down the COLOR CODE instead of the color name. The sealing wax color chart can be found here. "Sealing Wax All Color"
[TIPS] I am going to send out the wedding/company event invitation card. I have to make a large number of seals in short period of time, how to do it more efficient, easier and faster? There are two suggestions to save your time on making wax seals. Use the sealing wax for glue gun. There are no quantity shown in the listing. How do I know whether the initial or letter I want is in stock and available for order? All the stamp products in our store are made to order. Therefore don't worry about the stock. All initial wax seal and designer collection wax seal are available for order around the year. Which soldering iron can be used for the custom leather stamp? Where can I buy a soldering iron that is fitted to the custom leather stamp? Can I purchase a separate standalone soldering iron only? Can the stamp larger than 40mm x 40mm? Why there are some white smoke and bad smell coming from the soldering iron? This is a normal situation in the first few times usage. It is because the high temperature burns the wire inside the soldering iron. No more smoke comes out after few times of using the soldering iron. BUT please be reminded to keep away from children. Why the light on the temperature adjustable soldering iron keep on and off? This is a normal situation. It is because the temperature adjustable soldering iron contains a IC to control the set temperature. Once the working temperature is reached the set temperature, it will stop heating up until the IC detects the working temperature is dropped below the set temperature. Therefore you may find the light is keep on and off when the soldering iron is reach the set temperature. Is the branding iron works for foil stamping? As mentioned in above the foil stamping working temperature is much lower. Foil paper melts and burn above 250℃ (482℉), please set the temperature at 200℃ first and adjust up slow according to the stamp size. Make sure the stamp hold firmly. Pre-heat the soldering iron for 5-10 minutes. Please keep away from children and flammable material! Place the foil paper on the designed area. Sticker can be used to hold the foil position on the designed area. Increase the set temperature and stamping time, if the foil is not printed well on the leather. Here is video clip shown you how to do a foil stamping. Is the branding iron works for pastry and cake? Is the leather stamp suitable for the leather press with hammer or mallet? Is the custom leather stamp works for hot stamping and also the leather press with hammer and mallet.